It’s safe to say the New York Times likely would not publish a full-page ad from the American Nazi Party or even from someone as far from the center as Richard Spencer. 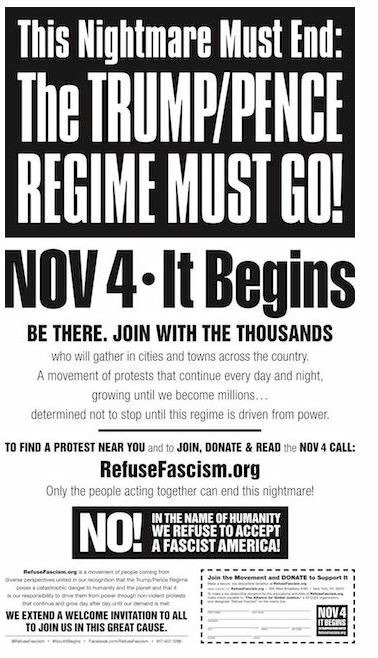 But on Nov. 1, the Times had no problem publishing an ad from the communist front group Refuse Fascism promoting mass protests designed to drive President Trump from power. The decision is ironic because the Times is running stories critical of media outlets that ran Russian ads and tweets from Russian activists during the 2016 election, even though the Russian effort was directed against Trump as much as Hillary Clinton. The group Refuse Fascism bragged about its Times ad on its website Thursday, proclaiming “Welcome New York Times readers!” and inviting donations. Actors and pop culture figures such as Michael Shannon and D.L. Hughley have also pledged support for the effort. Now, media outlets that have sought to expose tenuous “links” between the conservative movement and figures it designates as “far right” are promoting the Revolutionary Communist Party. The Huffington Post recently published an article from Carl Dix, who is identified as the “co-initiator” of Refuse Fascism.